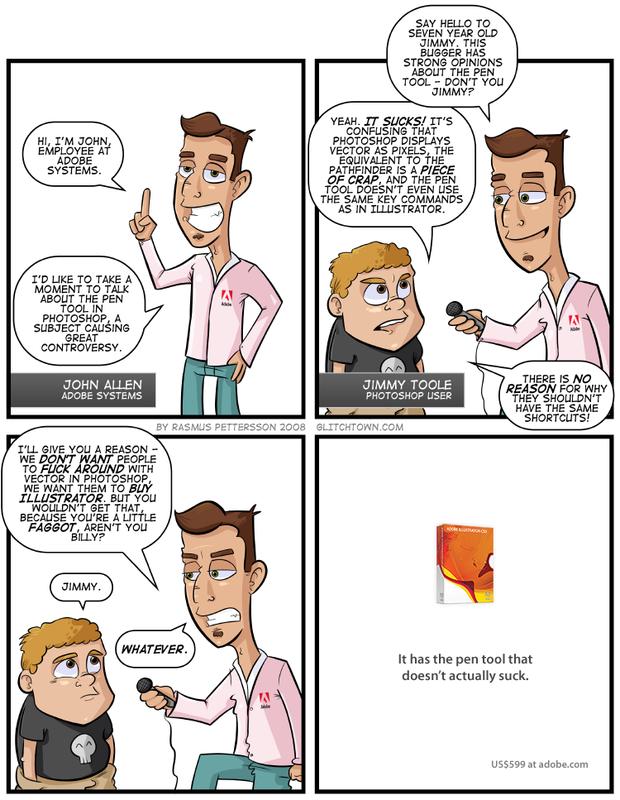 Maybe this is only funny to me, but I’m hoping I’m not the only one with a strong grudge against the pen tool in Photoshop, and, well… all the vector tools in Photoshop, really. WHY, oh why isn’t it like the pen tool in Illustrator? WHY, oh why can’t I just convert a point to an anchor point just by clicking it? WHY, oh why can’t I move the point using space, after I’ve clicked it out? WHY, oh why do the “add”, “subtract” an all the other pathfinder wannbe options reverse to default every time I’ve added/subtracted ONCE? And WHY. Oh why. Doesn’t Photoshop display vector as… uhm, I dunno… VECTOR? I know Photoshop is raster based and all, but so is Corel Painter, and the pen tool there delivers actual vector, with infinite quality, in real time. I’m ranting, I’m sorry. It’s one of my few complaints about Photoshop, so I guess it feels bigger than it is. I like the art in this one. It’s one of my best ones, I think. I like John as a character, if I can, I’ll be sure to use him again. And I think it’s kinda funny that Jimmy’s only 7 years old, and still knows what he talks about. This entry was posted on Friday, September 12th, 2008 at 12:26 am and is filed under Comic. You can follow any responses to this entry through the RSS 2.0 feed. Both comments and pings are currently closed.